The first reductions in vehicle exhaust emissions were achieved by improving engine design and tuning, but to reach the massively reduced levels of today, new add-on technologies had to be developed to attack specific pollutants and remove or chemically convert them. Often these had to be different devices, or combinations of devices, for the different kinds and sizes of engine. Three-Way Catalysts a 3-way catalytic converter (“catalyst”) is now standard on every gasoline-engined vehicle. The catalyst uses a ceramic or metallic core (known as a “substrate”) with a coating containing the precious metals, platinum, palladium and rhodium. These metals are the actual “Catalysts” that give the converter its name. They promote the required chemical reactions, but they themselves are not affected by it. Catalysts need high temperatures to work properly and this initially meant that relatively high emissions were allowed through during the warm-up period. Recent developments have reduced the necessary operating temperature and also made catalysts more robust so that they can be mounted closer to the engine and warm-up more quickly. These “fast light off catalysts” have vastly reduced emissions by cutting warm-up times so that the catalyst can start working within seconds. At the same time catalyst durability has increased, so low emissions are maintained for longer, without replacement. Three-way catalysts operate in a closed-loop system with sensors to monitor the exhaust gas composition, linked to a computerised engine management system which continuously regulates the air to fuel ratio to maintain the necessary conditions for the catalyst to oxidise CO and HC to CO2 and water (H2O) while reducing NOx to nitrogen (N). For this process to work properly, the mixture of exhaust gases has to be perfectly balanced because the pollutants actually react with each other and with oxygen in the air, to achieve the required result. This perfect balance or “stoichiometric proportions” require a relatively “rich” fuel to air mixture, Diesel engines which use a much lower fuel to air ratio, and modern gasoline engines using “lean burn” technology to improve fuel economy and reduce CO2, need another way to deal with the problem. Oxidation Catalysts convert CO and HC to CO2 and water and they also reduce the mass of particulate emissions by oxidising some of the hydrocarbons on the carbon particles. They can work with a low fuel to air ratio, but they don’t reduce NOx, so another device, or even a combination of devices, is required in addition. Evaporation of gasoline from the fuel system is potentially a much greater source of airborne hydrocarbons than tailpipe emissions, so modern gasoline vehicles are equipped with fuel systems which are fully closed and designed to maintain a stable fuel tank pressure without allowing vapour to escape to the atmosphere. A canister of activated charcoal absorbs excess fuel vapour which builds up in the system, especially in hot conditions, and holds it until engine operating conditions are suitable to accept a fuel-rich mixture. Then the vapours are purged into the engine intake manifold where they mix with incoming air and are burned in the engine. The canister is then cleared of fuel and ready for further use. 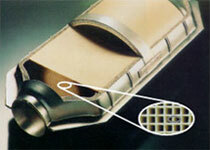 Particulate filters or Wall-flow Particulate filters remove particulate matter from the exhaust by filtration. They have a honeycomb structure like a catalyst substrate but with the channels blocked at alternate ends, which forces the exhaust gas to flow through the walls between the channels, filtering over 90% of the particulate matter out. The filters are self-cleaning, by one of a number of alternative methods which periodically modify the exhaust gas concentration in order to burn off the trapped particles oxidising them to form CO2 and water. Particulate filters become clogged by Sulphur, which is present as an impurity in Diesel fuel. It is therefore essential that “sulphur-free” (<10 ppm) Diesel fuel is made widely available to enable this key technology to be fully successful. Exhaust Gas Recirculation technology is able to reduce diesel nitrogen oxide (NOx) emissions by taking a carefully controlled portion of the inert exhaust gases, cooling it and re-introducing it to the combustion chamber when conditions are right to do so. This reduces the high concentration of Oxygen and the high temperatures in the combustion chamber, both of which are causes of NOx formation. NOx traps, NOx Adsorbers, or “traps” typically incorporate basic oxides such as barium oxide which reacts with NOx and stores it in the form of Nitrate when an engine is running “lean”. A periodic switch to “rich” operation for one or two seconds (or for Diesels the injection of a small amount of fuel into the exhaust) is enough to reverse the reaction and release the stored NOx so that a conventional three-way catalyst mounted downstream can convert it back to Nitrogen and water. Reduction of NOx is possible by using Selective Catalytic Reduction (SCR) technology. A SCR system uses an aqueous urea solution known as AdBlue® which, when injected in a specific way into a SCR catalytic converter, is converted into Ammonia. In the subsequent catalytic reduction phase, the Ammonia reacts with the NOX, producing nitrogen and water. This technology is becoming widely used on larger vehicles, which can take the additional AdBlue® tank, but work is continuing to develop systems suitable for smaller diesel vehicles.